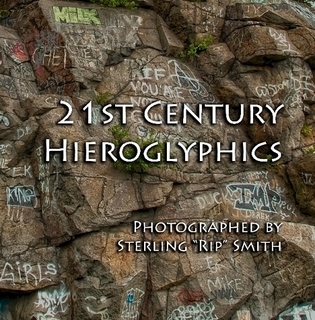 I just completed self publishing a small monograph of my images of the graffiti at the Quincy Quarry in Quincy, Massachusetts. The book contains all of the images from my September, 2009 ’21st Century Hieroglyphics’ exhibit at the Contemporary School for the Arts and Gallery in Hagerstown plus more images that have never been exhibited or published. 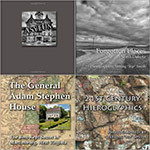 The images were captured in an old quarry in Quincy, Massachusetts. An area that at one time was filled with water has been filled in with earth, probably to prevent people from being injured or killed diving into the quarry water. The result is a grassy space surrounded by rock cliffs that have been liberally decorated with a wide variety of graffitti. I have made two trips to this place and it continues to be fascinating. Looking at these rough granite walls, you are assaulted by a visual cacophony of abstract designs, haunting beings, social commentary that ranges from poignant to sinister to celebratory to simply chaotic. As I walked around the area, I tried to imagine what an archeologist a thousand years from now would think upon the discovery of these strange messages painted on rock walls. Would they know about it that far in the future or would they look at this as evidence of some religious cult or political uprising. This is a small booklet, just 36 pages and 31 images. It was fun to put together and I think it makes a nice presentation of my work from the quarry. ~ by Admin2 on July 19, 2010.